This Corrugated Roof Sheet Making Machine is designed and manufactured by our company on the basis of absorbing advanced technology at home and abroad. This machine is suitable for the production of PP, PE, PS and other plastic sheets. Its high mixing speed makes it greatly efficient. Finished sheets are widely used in some temporary construction as walls or, for example, roofing sheets. 1. 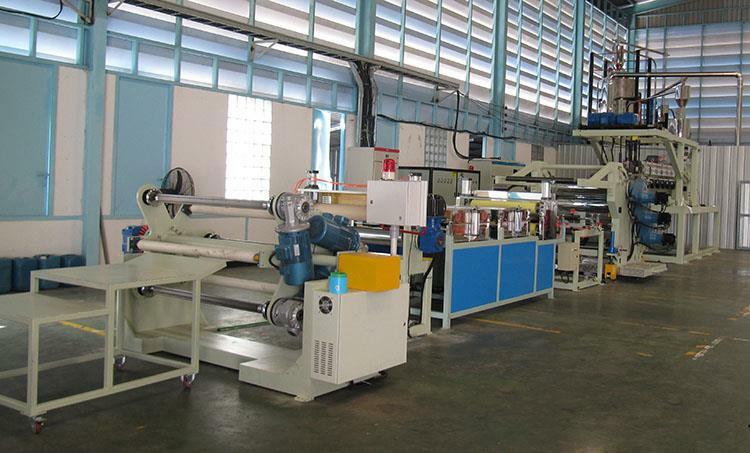 This Corrugated Roof Sheet Making Machine is designed and manufactured by our company on the basis of absorbing advanced technology at home and abroad. This machine is suitable for the production of PP, PE, PS and other plastic sheets. Its high mixing speed makes it greatly efficient. Finished sheets are widely used in some temporary construction as walls or, for example, roofing sheets. The sheet or sheet is light in weight and low in cost, but has high strength, short construction period and can be recycled. This machine has beautiful appearance, long service life, good performance, simple operation, reasonable price and good quality. 2. Corrugated Roof Sheet Making Machine's computer control cabinet can be programmed to set the length and number of contours. Its operating system language is English and Chinese, so it is easy to use. The machine will automatically cut the length and stop when the required number is reached. In addition to corrugated cardboard roofing, the line can also produce PC flats. The products that Corrugated Roof Sheet Making Machine produces can be used as roof lights and sun visors for office buildings, department stores, hotels, stadiums, schools, entertainment centers, hospitals, etc.